form all-male units and all-female units. only in a breeding season, males get fatten and start competing each other. 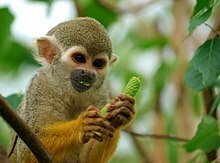 The squirrel monkeys are the New World monkeys of the genus Saimiri. They are the only genus in the subfamily Saimirinae.